A dog was rescued from a central road divider along the East Coast Parkway (ECP) at around 8.20am this morning (Jul 5). 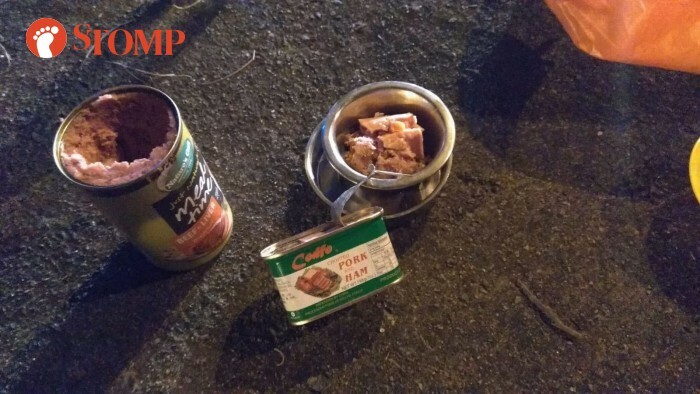 Stomper Anonymous had alerted Stomp to the rescue mission which involved personnel from the Society for the Prevention of Cruelty to Animals (SPCA), Animal Lovers League (ALL), Expressway Monitoring Advisory System (EMAS), and the police. Anonymous shared videos and photos that show the process of the capture. Stomp then got in touch with ALL to find out more information about the rescue. Catheryn, who is part of ALL's Rehoming Team, told Stomp that the dog had gone missing on Jun 23 during an outing at the East Coast Park, and was first sighted on Jun 27 before finally being found last night (Jul 4). She said: "ALL arrived to the scene at around 10pm, and we left at about 4am after setting a trap. We also laid food on the ground to lure Mama Pong out. "EMAS and the police had helped to control the traffic, by diverting it so that we could carry out the rescue. Especially in the morning, when the traffic flow is heavier. "Then the next day at around 8.20am, EMAS alerted us that a dog was in the trap, so we went down to check if it was indeed Mama Pong. "She is now safe and back in the shelter." Catheryn also added that she wanted to say a big thank you to SPCA, EMAS, and the police for their help. Stomp had also gotten in touch with Mohan, the co-founder of ALL. Mohan said: "Mama Pong was not injured, just a little dirty when found. "When caught, she even tried escaping by digging a hole through the ground. "But she is sleeping soundly now, back safely in my shelter." Recounting his first encounter with Mama Pong five years ago, Mohan said that she was also trapped in the centre of a road, along Jurong East Street 11. "I guess old habits die hard. "Five years ago, Mama Pong was found along with her puppies, and we had managed to get them out of a drain." Mohan also added that his shelter is a no-kill shelter. "No animals are put down, they stay here for as long as they live."